It’s hard to imagine these days, but newspaper comics were once a place where adventure reigned. Alongside genuinely funny humor strips (also hard to imagine in this day of watered-down, milquetoast comics pages where blandness seems a requirement), there were wonderful adventure comics, like Prince Valiant, Tarzan, Flash Gordon, Rip Kirby, Wash Tubbs, Buzz Sawyer, The Phantom, Mandrake the Magician, Red Ryder, and many others (some of which still exist as pale shodows of their former incarnations). Two of the best and most influential were Terry and the Pirates and Steve Canyon, both created by Milton Caniff. Caniff has been called “The Rembrandt of the comic strip”, fitting perhaps both because of his importance in the ranks of great comics artists and, in particular, for his mastery of chiaroscuro, the use of highly contrasting areas of dark and light. Caniff was a pioneer of the adventure strip and one of the undisputed masters of the form. He was very influential on other comics artists (and illustrators) of his day, and was featured on the cover of Time magazine in 1947. Caniff’s remarkable high-contrast style, shared in part with his early collaborator Noel Sickles, also a fantastic adventure comics artist, has been a tremendous influence on modern comics artists like Alex Toth, Frank Robbins, Jamie Hernandez, Mike Mignola, David Mazzuchelli, Tim Sale and, in particular, Frank Miller, notably in his work in the Sin City books, as well as a number of other comics artists who are working in a high-contrast style (often influenced by Miller and perhaps unaware of how much he has carried over from Caniff). Both Terry and the Pirates and Steve Canyon were adventure stories in the 30’s and 40’s adventure film mold (think Indiana Jones), about wild spirited pilots in search of adventure and trouble. Caniff left a successful 17 year run on doing Terry and the Pirates for the New York Daily News, and started Steve Canyon for for the Chicago Sun because he wanted more control over his work. During World War II, in the latter part of his run on Terry, Caniff also did a strip called Male Call, (strips online here) which ran in military newspapers and for which he accepted no payment; he considered it a contribution to the war effort. While both Terry and Steve Canyon are great strips, I tend to prefer Terry and the Pirates (from which we get the term “Dragon Lady”) because of its atmospheric, far-Eastern strange-lands-and-pirates milieu; and despite its occasional unflattering portrayal of women, non-white races and otherwise politically incorrect leanings. These were perhaps more a reflection of the times than any intentional meanness on Caniff’s part, but criticism has been leveled in hindsight at Caniff for that, as well as his participation in such government sponsored weirdness as this illustrated WWII pamphlet fot the U.S. Army called How to Spot a Jap. Terry and the Pirates and Steve Canyon are both terrific top-of-the-form classic adventure comics. Most of the Reprints of Terry that I’m aware of are out of print, but worth looking for. Steve Canyon, on the other hand, is available in a number of inexpensive volumes. Unfortunately, the strips, though printed OK, are small. Early daily comic strips were printed large, often at the full width of a newspaper page, as contrasted to the tiny splotches they’ve been reduced to by modern newspapers as part of their concerted campaign to drive away readers. 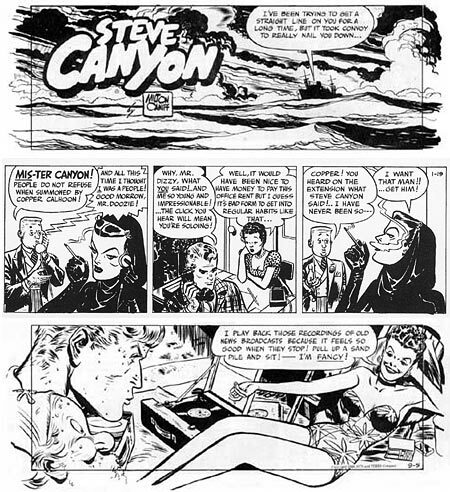 There is a new biography and analysis of Caniff’s work, not yet published but due soon, Meanwhile…: Milton Caniff, Terry and the Pirates, and Steve Canyon by R.C. Harvey, that also promises to be a fascinating look at the art and business of newspaper comics in their heyday. You can read bit more on Harvey’s site about his previous book on Caniff, Milton Caniff Conversations. There are some extensive bio pages The King of the Comic Strips, Milton Caniff (page 2 here) from Steve Stiles. There is also a good short bio on Comiclopedia (from which I borrowed two of the clippings shown above). A special treat right now is that the original Steve Canyon strips are being made available online, with permission from the artist’s estate, on the Humorus Maximus site. They start here. (There is no “Next page” button, click on the next date, in this case January 22, to advance.) This is a rare opportunity to read one of the great newspaper adventure strips day-by-day, as if it were a currently running strip. Compare it to what passes for newspaper comics today and be amazed. I love New Yorker covers. For years the venerable magazine has been featuring illustrations, often by cartoonists and illustrators working in a cartoon-like line and color style, that can be funny, poignant, beautiful, wistful and, at their best, reminders of the beautiful in the ordinary, glimpses of commonplace scenes that are suddenly brought into light as remarkable and worthy of attention. Over the years some of the most effective of the latter have been by Arthur Getz. 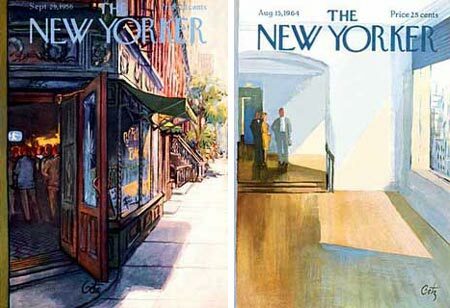 Getz was an illustrator and painter who created more New Yorker covers than any other artist (213). His palette ranged from the darks of night scenes to the bright, almost bleached out light of sunny days. He had a knack for composing paintings out of scenes that other artists might never notice and painting them with a deceptively casual style that actually reveals a superb eye for composition, color and the effects of light. In addition to his New Yorker covers, Getz did hundreds of pen and ink spot illustrations for the magazine, as well as illustrations for Esquire, Fortune, The Nation and other publications. He also created murals for public spaces, including one for the 1939 World’s Fair. He was also a well-respected instructor at the School of Visual Arts in NYC, the University of Connecticut and other schools. Feeling his name as an illustrator would interfere with his gallery work, he exhibited his gallery paintings for many years under the pseudonym of his middle name, “Kimmig”. Getz also illustrated children’s books, including four he wrote himself. There is a web site devoted to Getz’ work, maintained by his daughter, Sarah. One of the best places to see work is in the CartoonBank archive, from which you can purchase original artwork as well as prints of his remarkable New Yorker covers. There was also a nice piece about Getz in the New Yorker in 2002, called Cover Gallery: Glimpses of Light. I received a review copy of The New Creative Artist: A Guide to Developing Your Creative Spirit by Nita Leland from North Light Books. Leland is the author of several popular books including Exploring Color, Creative Collage Techniques, and The Creative Artist, her first book, of which The New Creative Artist is a considerably revised and expanded version. Leland often brings her resources to bear in service of those who need some help or guidance getting started down an artistic path. She has been teaching workshops since the ’70s, and her books, in particular The New Creative Artist, work hard at building a bridge onto that path, either for beginners or even seasoned artists who are struggling with being “blocked” or are in need of a recharge for their artistic confidence. The New Creative Artist is a compendium of suggestions, exercises, and short articles on various ways to jump start the creative process. Like Bert Dodson’s Keys to Drawing with Imagination, also from North Light Books, which I reviewed a few weeks ago, Leland’s creativity enhancement principles are not new, the value is in her choice and presentation of them. 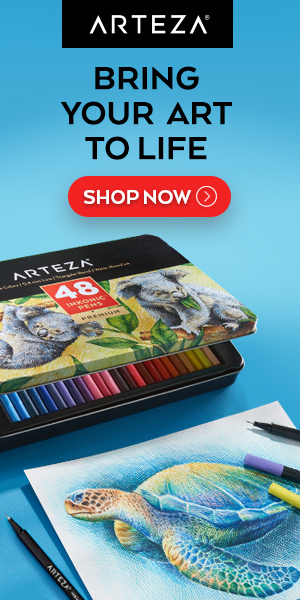 Like Keys to Drawing With Imagination, The New Creative Artist makes those techniques specific to artistic creation, as opposed to the many creativity enhancement books that try to cover all bases and include business and office creativity in the mix. Also like that book, this one is bound as a spiral/hardback hybrid meant to lay open flat on your drawing table while you work. Unlike Keys, which is specifically related to drawing, Leland’s book is more generally oriented to a variety of artistic endeavors, including painting, drawing, collage, and even crafts like fiber arts, papermaking and decorative painting. In the process, The New Creative Artist serves as a brief introduction to a multitude of artistic techniques. Various mediums and working methods are mentioned briefly, but with enough detail to engage in them. Her section on Drawing Methods, for example, gives you short but workable descriptions of contour drawing, gesture drawing, portraiture, figure drawing and even the Surrealists’ specialty of automatic drawing. She also talks about design in relation to composing works, and the importance of elements like shape, value, rhythm, contrast and balance. Design is perhaps an issue in the appreciation of the book, The book itself is an intense exercise in book design (by Wendy Dunning, possibly in collaboration with Leland). It is full of colors, patterns, textures and graphic elements meant to look like notes or scraps of paper, with exercises and quotes written on them, scattered about as if lying on top of the pages. It’s illustrated with works from a number of artists, in addition to Leland’s own, that generally use a bright palette. While sure to be delightful to some, The overall effect is, to my eye, a bit feminine, and may be off-putting to hard bitten concept artists, comic book artists and dyed-in-the-wool starving-in-a-garret bohemian painters. If you can get past that initial impression, and the cheery, informal, hand-holding tone of the text, you may find that the techniques are just as valid as if printed in plain Garamond on stark white pages. 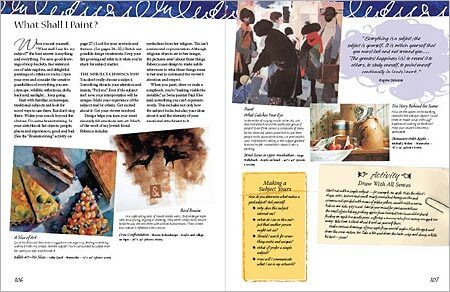 There is an online preview of the book, which allows you to thumb through small but legible examples of over 30 pages. Though of potential benefit to almost any artist who wants a source of techniques for unblocking and reviving artistic confidence, (one the best of which, I feel, is to break from what you are used to doing and explore another approach, medium or set of tools, as this book suggests), the The New Creative Artist is more directly aimed at those who are working to get started, and who will find it full of gentle encouragement and a wide array of approaches to creative exploration. Jonny Duddle is, as far as I can determine, a concept artist for the gaming industry who lives in the UK. The “Who” section of his website just has a “More info soon” line above a row of photos that look a bit like a criminal line up; but we’ll ignore that in light of the fact that the “How” section, right next door, has nice step-by-step breakdowns of the creation of three of his wonderfully silly and exaggerated images, including the image shown here. Duddle’s images have the feeling of highly rendered cartoons, brushed out with plenty of texture, lots of color and a good dose of flippant attitude. Monkeys and/or apes feature prominently in many of them, including a series of astronaut chimp images and a series he calls “Monkey Girl” of which the image at left is a part. Some of the work on the site, notably in the “Games” section, is from his professional work on games like Milo and the Rainbow Nasties, Looney Tunes: Back in Action, and E.T. : Return to the Green Planet. The brief bit of text in that section tells us we can’t expect to see more games images from him for a some time for contractual reasons; but we’ll ignore that in light of the “Stories” and “Gumph” sections, which are chock-full of fun stuff, apparently done for his own amusement. The former featuring work done around story-like themes, if not for actual stories, and the latter a place to fit things that don’t fit the former. In addition to the detail images you can find in the course of the step-by-step breakdowns in the “How” section, you will occasionally see icons next to images that say “Big?”, and link to some genuinely large close-ups of the images. For reasons that elude me, Duddle’s site opens in a pop-up window, uses frames and is too big for its window at times; but we’ll ignore that in light of the fact that his opening page indicates that his site is due for a major overhaul. Duddle paints digitally. Only one of his step-by-step sequences includes any commentary at all, and it’s pretty breezy; but we’ll ignore that in light of the fact that Duddle is now a regular contributor to ImagineFX, a UK magazine devoted to digital fantasy and science fiction art, and the magazine’s web site includes several of his workshops, including Go Berserk in Photoshop and Perfect Brushes in Photoshop, followed, ironically, by Defecting to Painter, and Painter related posts like Getting Messy with Oils and Mixed Media Experiments (part 3), in which he uses both apps together. In the course of this post, I’ve probably told you less about Duddle’s work than I have about the structure of his web site; but we’ll ignore that. 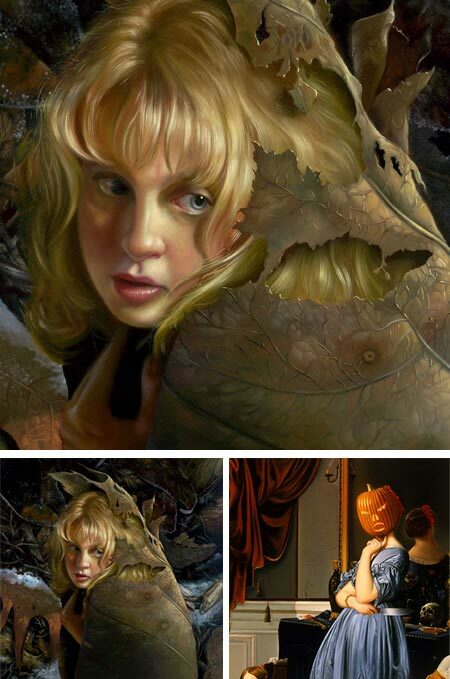 David M. Bowers started his career as a studio staff artist, transitioned into illustration and then into gallery painting. He has been splitting his time between illustration and his personal work and is now concentrating more on the later. Over the course of his successful illustration career he has received a number of awards from the Society of Illustrators, including a Gold Medal, several Silver Medals and a “Best of Show”, and has been featured in Communication Arts and the Spectrum fantastic art collections (for which the image above, left and detail, top, was chosen as the cover for last year’s Spectrum 12). Two of his paintings for Time magazine covers are in the permanent collection of the National Portrait Gallery. His beautifully refined oil paintings carry the feeling of Renaissance and Baroque masters, imbued with layers of implied meaning and spiced with imaginative imagery characteristic of the symbolists and surrealists. His carefully composed and subtly lighted images can appear almost starkly realistic at times, but there always seems to be an undercurrent of meaning, or a suggestion that something is not as it seems, like his scene of normal looking patrons at an apparently ordinary bar, that just happens to have Vermeer’s Girl with a Pearl Earring hanging on the wall between the beer signs. At other times Bowers’ images can be overtly fantastic, and are sometimes wickedly funny, like his wonderful pumpkin headed version of Ingres’ portrait of Comtesse d’Haussonville (image above, right). Bowers’ painting technique is very much in the classical tradition. He devotes a page on his site to describing of his painstaking painting process, which I’ll attempt to summarize here because it makes a nice brief account of the traditional academic painting techniques that have been handed down since the Renaissance. He starts with a ground of real gesso, prepared with rabbit skin glue, chalk and zinc (as opposed to acrylic “gesso” which should more properly be called acrylic primer and is not actually the best surface for oil based paint). Rabbit skin glue smells terrible, has to be heated up in a double-boiler pan, takes a lot of time an effort and is a PITA to work with, but it actually sizes the canvas, and, properly primed, makes a superior surface for painting. He then paints a monochromatic underpainting, which separates the painting of value from color, as has been tradition since oil painting was first in common use (see my post on Jan van Eyck). Bowers paints his underpainting in earth colors. The greenish cast of the burnt umber in the skin areas is reinforced with a transparent layer of green. This is a traditional Renaissance technique that gives the final reddish skin tones variation, depth and strength. Similarly, a green tree will have a reddish undercolor. He then layers in the final colors, working carefully from background to foreground, finally applying layers of translucent glazes, sanding the layers as they dry with pumice stone powder. The final painting is sanded again and varnished to bring out the luster and depth of the glazes. This meticulous process has yielded results for generations of painters and it serves Bowers well. When viewing the paintings in the galleries and Exhibitions sections of his site, don’t miss the Prints section, which includes detail images. Illustrator, calligrapher and puzzle maven Leah Palmer Preiss lists her influences as “medieval manuscripts, Mad magazine, art nouveau, Alice in Wonderland, Morse code, Persian miniatures, Monty Python, scientific illustration, 17th Century poetry, Flemish Renaissance paintings and the art of the insane”. 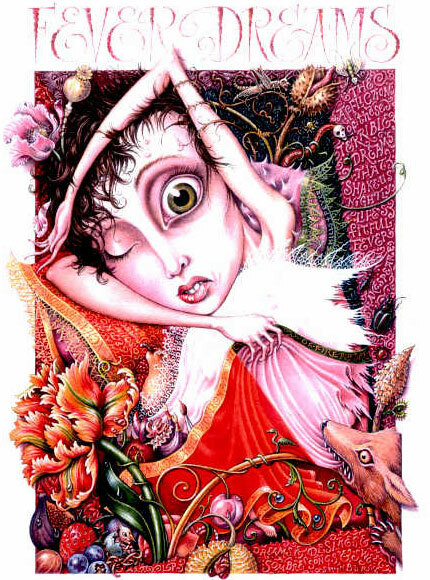 If that sounds like an insane combination, it’s wonderfully so, and her quirky, funny, highly textured, obsessively detailed, lovingly rendered and richly imaginative illustrations bear that out. Her client list includes HarperCollins, Macmillan, Viking, the Utne Reader, New York Life, Woman’s Day and a list of advertising agencies and greeting card companies. In addition to her mainstream editorial illustration an children’s book illustration, she has something of a specialty in the form of illustrations that are also visual puzzles. Done primarily for children’s periodicals, these are detailed images that combine her illustration and calligraphy skills with her fascination with brain teasers to create one-stop entertainments for the brain and eye. You will also find “messages” in her other editorial work, like the “Fever Dreams” piece shown above. Included in the Illustration section of her site, she lists “Maniatures”, though she doesn’t include indications of the size of these, presumably small, expressions of visual mania. The images on the site are just big enough to get some feeling for the intricacy and detail in her work, but can be a little small for appreciating the puzzles. Unfortunately, there isn’t a collection of her work yet that would allow us to see them together in print. Also unfortunately, her web site is a bit of an unintentional puzzle at the moment. The imagemaps that provide the links for the main navigation elements on the left side of her site are flawed, and you can sometimes click on part of the section title and not get a response (and I can’t give you direct links because the site is in frames). Just move your mouse and try again, it’s worth the trouble. Preiss has taken “curiouser and curiouser” as her motto, and her fascinating images can leave you curiouser for more.